It was so scenic ! My old friend Y who was senior student in the university we graduated took me the Ueno park where is the most popular sightseeing spot of cherry blossoms in Tokyo. There are 19kinds , more than 1,200 cherry trees in the park. of course so do I. The park was congested with people. As a matter of fact, It was a little bit cold and cloudy. 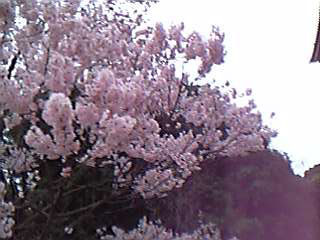 But, I was quite happy and satisfied,because I could see such splendid scenery of cherry blossoms with my friend who is very important me.